2017-10-17 10:47:56-06 hulk Sophos Bootstrap: [SMESophosBootstrapAppDelegate.m:1656] System verified 2017-10-17 10:48:36-06 hulk Sophos Installer: [SMEInstallController.m:237] Installing saas version 9.6.5 2017-10-17 10:48:36-06 hulk Sophos Installer: [SMEInstallController.m:857] Upgrading the "saas" product 2017-10-17 10:48:36-06 hulk Sophos Installer: [SMEAggregateInstallStrategy.m:93] "installer.prepare.stopProcesses" success: YES 2017-10-17 10:48:36-06 hulk Sophos Installer: [SMERemoveFilesStrategy.m:110] Removing files belonging to components: [prepare] 2017-10-17 10:48:36-06 hulk Sophos Installer: [SMEAggregateInstallStrategy.m:93] "installer.prepare.removeComponents" success: YES 2017-10-17 10:48:36-06 hulk Sophos Installer: [SMEAggregateInstallStrategy.m:93] "installer.prepare.removeKeychains" success: YES 2017-10-17 10:48:36-06 hulk Sophos Installer: [SMEReceiptClient.m:199] Failed to launch receipt at /Library/Application Support/Sophos/saas/Installer.app/Contents/MacOS/tools/InstallationDeployer. launch path not accessible 2017-10-17 10:48:36-06 hulk Sophos Installer: [SMEReceiptClient.m:56] Failed to launch receipt. 2017-10-17 10:48:36-06 hulk Sophos Installer: [SMEReceiptClient.m:199] Failed to launch receipt at /Library/Application Support/Sophos/saas/Installer.app/Contents/MacOS/tools/InstallationDeployer. launch path not accessible 2017-10-17 10:48:36-06 hulk Sophos Installer: [SMEReceiptClient.m:73] Failed to launch receipt. 2017-10-17 10:48:36-06 hulk Sophos Installer: [SMEBuildInstallPlanStrategy.m:115] Failed to connect with receipt 2017-10-17 10:48:36-06 hulk Sophos Installer: [SMEAggregateInstallStrategy.m:93] "installer.localPayload.buildPlan" success: NO 2017-10-17 10:48:36-06 hulk Sophos Installer: [SMEAggregateInstallStrategy.m:93] "installer.localPayload.cacheManifestComponents" success: NO 2017-10-17 10:48:36-06 hulk Sophos Installer: [SMEAggregateInstallStrategy.m:93] "installer.localPayload.remoteRemove" success: NO 2017-10-17 10:48:36-06 hulk Sophos Installer: [SMEAggregateInstallStrategy.m:93] "installer.localPayload.createUsersAndGroups" success: NO 2017-10-17 10:48:36-06 hulk Sophos Installer: [SMEAggregateInstallStrategy.m:93] "installer.localPayload.installComponents" success: NO 2017-10-17 10:48:36-06 hulk Sophos Installer: [SMEAggregateInstallStrategy.m:93] "installer.localPayload.processStart" success: NO 2017-10-17 10:48:36-06 hulk Sophos Installer: [SMEAggregateInstallStrategy.m:93] "installer.localPayload.distributeNotifications" success: NO 2017-10-17 10:48:36-06 hulk Sophos Installer: [SMEAggregateInstallStrategy.m:93] "installer.writeReceipt" success: NO 2017-10-17 10:48:36-06 hulk Sophos Installer: [SMEInstallController.m:467] "installer" success: NO 2017-10-17 10:48:36-06 hulk Sophos Bootstrap: [SMESophosBootstrapAppDelegate.m:1131] Received failure notification: (1) 2017-10-17 10:48:36-06 hulk Sophos Installer: [SMEInstallController.m:347] Successfully sent the installer telemetry 2017-10-17 10:48:37-06 hulk Sophos Installer: [SGCServerAuthenticator.m:159] Server connection successfully validated 2017-10-17 10:48:38-06 hulk Sophos Installer: [SGCCDFSBroker.m:306] Feedback json file was successfully uploaded (status code: 201). 2017-10-17 10:48:38-06 hulk Sophos Installer: [SMEInstallController.m:377] Failed to update saas to 9.6.5 2017-10-17 10:48:38-06 hulk Sophos Installer: [SophosDistantObject.m:219] An exception was encountered while messaging the server: SophosNilProxyException. 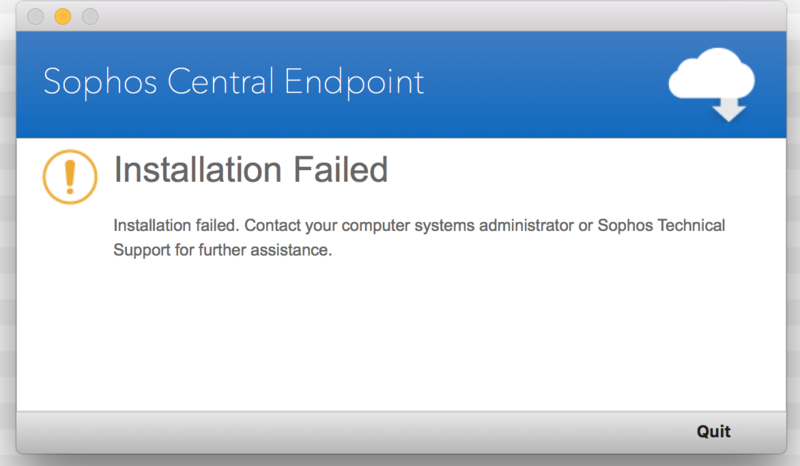 then run the Sophos Antivirus installer again and the process should complete successfully. You are currently browsing the MarcoMC blog archives for October, 2017.